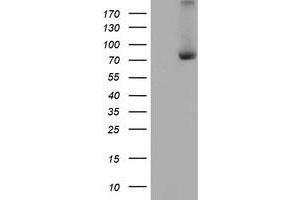 HEK293T cells were transfected with the pCMV6-ENTRY control (Left lane) or pCMV6-ENTRY C1S (Right lane) cDNA for 48 hrs and lysed. Equivalent amounts of cell lysates (5 µg per lane) were separated by SDS-PAGE and immunoblotted with anti-C1S. Background This gene encodes a serine protease, which is a major constituent of the human complement subcomponent C1. C1s associates with two other complement components C1r and C1q in order to yield the first component of the serum complement system. Defects in this gene are the cause of selective C1s deficiency. The concentration of the product may vary between diferrent lots. Buffer PBS (PH 7.3) containing 1 % BSA, 50 % glycerol and 0.02 % sodium azide.